GEORGETOWN, S.C. -- Twelve days after the once-fierce Hurricane Florence arrived on the Carolina coast, and more than a week after it blew north and dissipated, rivers swollen by the storm's relentless rains are still flooding homes and businesses in their paths as they make their way to the sea. The slow-moving disaster has allowed forecasters to pinpoint exactly who will flood. There have been few rescues or surprises in South Carolina -- just black, reeking water slowly seeping in and even more slowly receding. 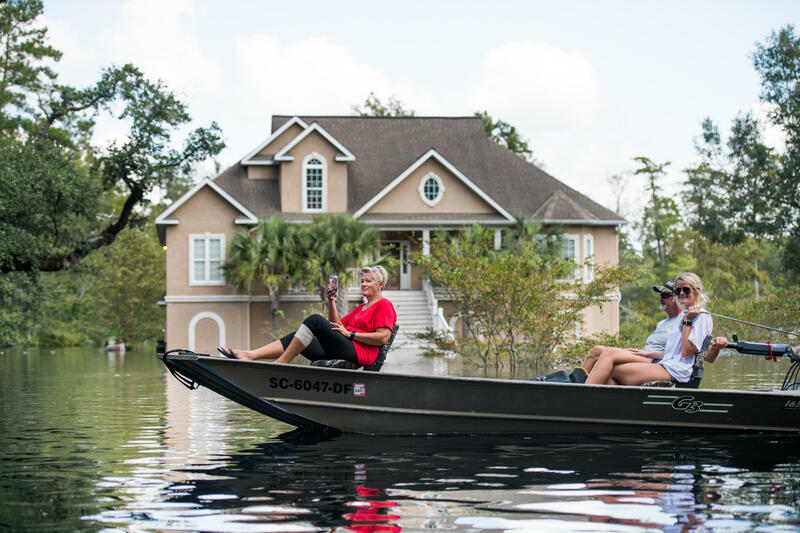 A week ago, firefighters in Conway, South Carolina, went to a neighborhood and told surprised residents their houses would flood from Florence -- even though they had never had water in them before. On Monday and Tuesday, those same firefighters checked on the same neighborhoods with maps that detailed each of the nearly 1,000 homes that could expect to be inundated. "It's kind of playing out exactly like we forecast," Conway Fire Chief Le Hendrick said. In one part of the city on Tuesday, some homes were surrounded by six feet of floodwater, CBS affiliate WBTW-TV reported. "These are all great people who pretty much lost everything," said Bob Joncas, whose home is in a Conway neighborhood. The Waccamaw River, which flows through the city of 23,000 and floods at 11 feet, was expected to crest on Wednesday at 21.7 feet. On Friday, it surpassed the previous record high of 17.9 feet set in 2016 by Hurricane Matthew. The waterway was not expected to drop below 18 feet or so until sometime next week. If that weren't bad enough, more weather was forming off the coast in a hurricane season that still has two months to go. National Hurricane Center forecasters watching a low pressure area about 200 miles south of Cape Hatteras, North Carolina, said it could become a tropical depression as it approaches the coast before moving quickly to the north. Not far from the ash ponds, engineers are keeping an eye on U.S. Highway 501, the main link to Myrtle Beach. Water is now touching a temporary barrier of sand and plastic that has been erected to keep water off the bridge. Called the Lifeline, the temporary wall will remain effective if the water doesn't rise more than an additional 5 feet from its current level, according to the state Department of Transportation. In North Carolina, which has still been dealing with the storm's after-effects including fallen trees, debris and floodwaters, the recovery process is really just beginning. The state on Tuesday reported another death caused by Hurricane Florence and its remnants. North Carolina Gov. Roy Cooper's office said a 67-year-old man died while cleaning up storm debris in Craven County, and the state medical examiner's office determined that the death was storm-related. The man, whose name wasn't immediately released, died after falling and fracturing his neck while cleaning up on September 18, days after the storm made landfall, said State Emergency Management spokesman Keith Acree. Cooper said the death is the 36th storm fatality for the state. Across multiple states, at least 47 deaths have been attributed to Florence.